Amid a growing number of E. coli cases stemming from visits by people to certain Chipotle (CMG – Get Report) locations in Washington State and Oregon, the popular burrito joint may have another scare to contain. That is, investors continuing to flee its stock should the company miss its sales guidance for the full year as consumers across the country avoid one of their favorite lunch and dinner spots due to health concerns. Shares of Chipotle are already down about 6% this week as the E.Coli news has gained nationwide attention, hinting investors are worried about fourth quarter sales trends. And they should be. Chipotle’s full year guidance calls for a same-store sales increase in the range of a low to mid-single digit percentage. For the nine month period that ended Sept. 30, Chipotle’s same-store sales have increased 5.5%. Consumers voicing concerns about eating at Chipotle on Twitter suggest the restaurant chain may be currently dealing with sluggish sales more broadly. “Certainly there will be a short-term sales impact, say over the next month, given the attention and social media buzz — consumers don’t tend to think of food safety issues until they actually happen,” said David Henkes, vice president at food industry research firm Technomic. Not helping Chipotle’s attempt to reach its sales goals for the year is that sales prior to the E.Coli outbreak, which were first reported last Saturday, were somewhat lackluster. The company admitted on an Oct. 20 earnings call with analysts that sales in October had been “very, very choppy” and cooled in August and September following a burrito giveaway promotion in July. Ells’ comments come on the heels of more people reporting E. coli symptoms following recent visits to several Chipotles in Washington State and Oregon. On Saturday, the number of E. coli cases in the two states stood at 22 but that has since increased to 37. In Oregon, the number of confirmed cases increased from 3 on Saturday to 12 on Tuesday, with at least eight of those people becoming ill after eating at a Chipotle. Meanwhile, health officials in Washington State reported six new confirmed cases of E. coli, bringing the total sickened in the outbreak in the state to 25. A Washington State health official said 23 of the 25 people ate at Chipotle restaurants. 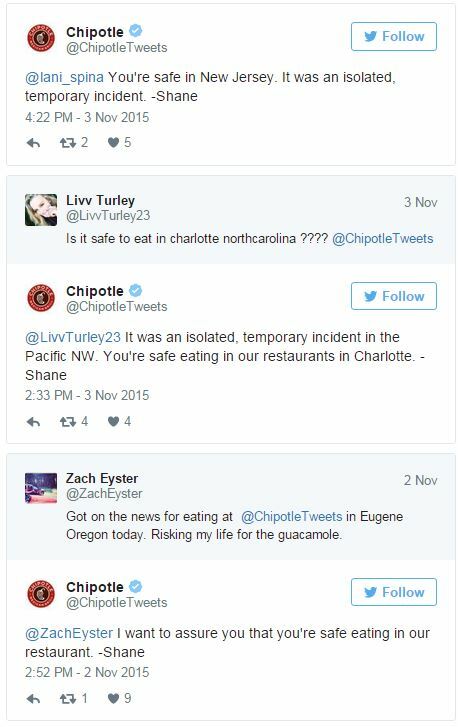 A total of 43 of Chipotle restaurants, or about 2.3% of its total U.S. locations, remain closed in Oregon and Washington. According to Chipotle’s statement on Tuesday, it’s taking multiple measures to correct any problems at the closed locations. Specific actions underway include conducting additional deep cleaning and full sanitization of the restaurants in the area, replacing all food items in the restaurants closed, and batch testing some ingredients before resupplying.